Cephalopods, the group of animals including octopus, squid, and cuttlefish, are famous for their remarkable ability to modulate body coloration and patterns instantly. With this ability, they can easily blend into surrounding environments or send warning signals to other animals. Reflectin, a protein that exists exclusively in cephalopods, is responsible for this structural color change. However, its origin and working mechanism are still unknown. Researcher Xie Can from School of Life Sciences, Peking University, and his co-workers carried out a 5-year research and traced the origin of the reflectin gene back to a transposon from the symbiotic bioluminescent bacterium Vibrio fischeri. They hypothesized that a horizontal gene transfer (HGT) event introduced the reflectin gene into ancient cephalopods. In addition, the hierarchical structure of reflectin protein was reported. Activated by some chemical molecules and neurotransmitters, reflectin is able to form ordered structures swiftly. 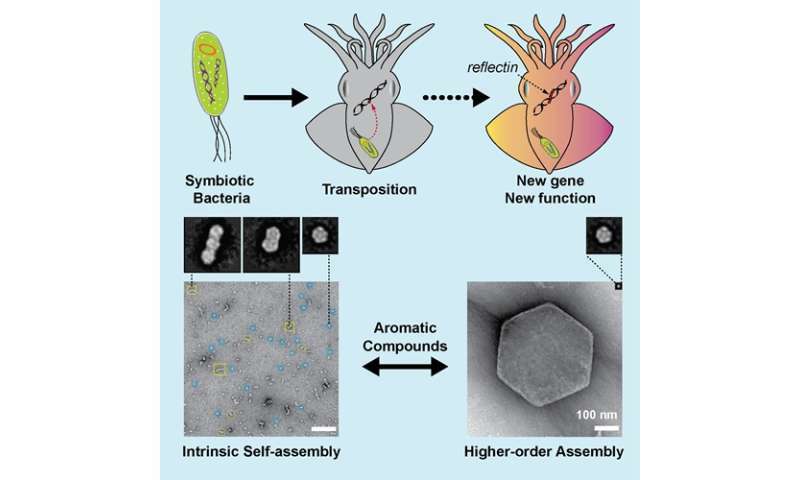 Moreover, the team also found that self-assembly and higher-order assembly in reflectin originated from a core repeating octapeptide, which may be from the aforementioned symbiotic bacteria, and named it "protopeptide." The discovery was published online in Current Biology as the cover paper, with PhD Student Guan Zhe and Cai Tiantian as the co-first authors and Xie Can as the corresponding author.